Mosinee High School senior Christina Wenman with her book, "Success Through Your Eyes: Learning From Your World to Find Your Way." Photo courtesy of Christina Wenman. Christina Wenman admits it: you typically wouldn’t ask a high school student for life advice. "As a 16-year-old I didn’t have a lot of experience," Wenman says. "Experience comes with time, and same with wisdom." But the Mosinee High School senior was curious about success, and how the definition changes depending on who you talk to. So last year, she started asking people about it. 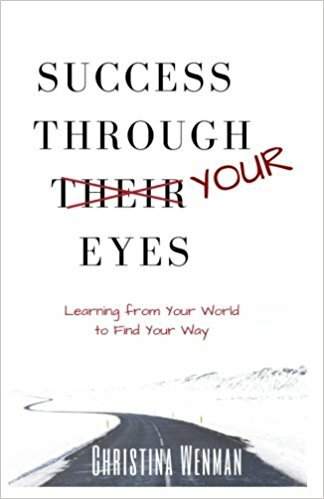 The result was a self-published book, "Success Through Your Eyes: Learning From Your World to Find Your Way." It’s made up of nine interviews with a diverse group of people, including motivational speakers, businesspeople, and a Marine. It’s more of a personal journey than a self-help book. Through all of her interviews, Wenman says she saw three main threads: the importance of authenticity, the need for continuous learning, and the connection between success and happiness. "I try to bring home the point that sometimes we get caught up in finding other people’s definition of success, whether that be through money or impressing people," she said. "And we kind of focus less on what we want and what our definition of success is." Wenman said many of her classmates are seeking out success as they plan their post-graduation paths. But sometimes, there’s a disconnect between what they plan to do and what they want to do. She talked with one friend who said he planned to go to either business or medical school after graduating. One of them ought to get him a good job, he thought. Then, he’d be happy. But he told Wenman that if he could do any job in the world, barring money, he’d be a history teacher. He liked the idea of inspiring kids and doing something he loved. Wenman said she was heartbroken to hear he’d rather pursue the job that made a lot of money instead of the job he thought he’d love to do. "Everyone’s definition of success is different, so I’m not gonna say whether monetary success should or should not be a part of your whole success definition," she said. "But I think it was really interesting to be able to hear that." One reassuring thing Wenman discovered through her research was that even adults don’t have life all planned out — they’re still figuring out their own definition of success, too. "I really just encourage people and encourage the reader to find out what they want in life, as opposed to listening to everything else that the word has to say and all the noise," Wenman said.